Kapitan chicken is one of the unique breeds in the curry family. 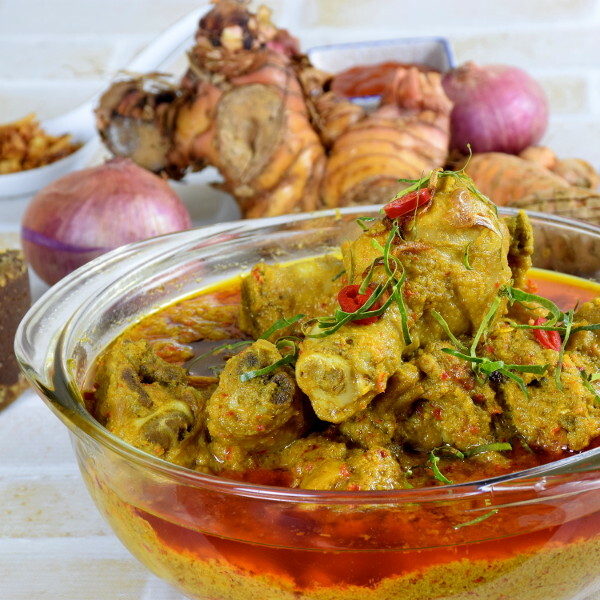 Kapitan chicken (Ayam Kapitan in Malay) is truly a Malaysian curry, the amalgamation of the diverse array of Malay, Chinese and Indian eating culture. 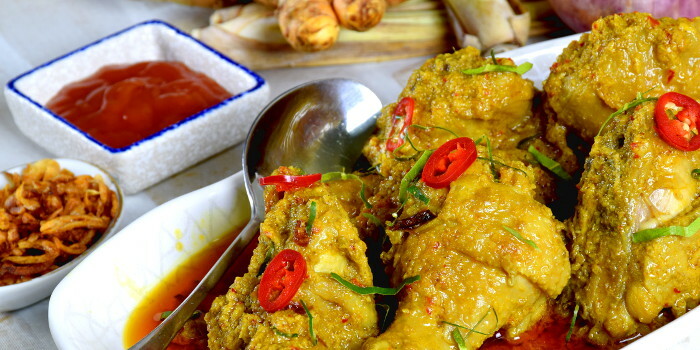 The unique flavor of this Nyonya chicken dish is the result of the complex interplay of a myriad of herbs and spices used by the Malays and Chinese. It is the least spicy Malaysian curry which is ideal for anyone who is unable to bear the heat from some other fiercely hot curries. So you will expect to savor a pot of milder curry with only half of the quantity of chili with fresh ingredients like turmeric, shrimp paste, palm sugar, and tamarind. Before we drill down to the detail how to prepare it, take a look at the legend and the history behind Kapitan chicken. The name Kapitan Chicken (Captain’s chicken) is derived from a fun legend back in the British colony time in Malaysia. According to Malaysian history, legend has it a Chinese chef of a ship owned by the British was eager to learn how to cook the local cuisine. One day, he saw a Malay woman preparing a stewed chicken dish in the kitchen permeated with the unfamiliar, exotic flavor. He asked the woman if she is willing to share her recipe, whom she obliged. The woman told him that it is a chicken curry dish and graciously show him the method of cooking. Upon returning to his kitchen, he realized that it could be too spicy for the British captain and the crew members. He improvised the recipe by drastically reduced the spiciness and enhanced with some Chinese ingredients. His toned-down version of the curry received raved reviews from the captain and his guests. When the captain asks him what the name of this dish is, he was caught off guarded and was just by murmuring “Ayam Kapitan,” which means captain’s chicken in Malay. The name has since stuck with this dish among the locals until today. The fundamental characteristic of Kapitan Chicken is the use of the traditional Malay herbs and spices with a touch of Chinese technique. This Malaysian curry has a distinct Nyonya flavor as a result of the combination of lemongrass, galangal (a type of ginger, also all blue ginger), turmeric ( the Chinese call it as yellow ginger ), coconut milk and belacan (local shrimp paste). Cut the chicken into large chunks, bone-in, and skin-on. The chicken should be marinated with ground turmeric, salt, and some vegetable oil. Marinate the meat before stewing is a common practice among the Chinese to let the flavor penetrate into the meat. This technique ensures the flavor is locked inside the chicken after prolonged stewing. You can use ALL the salt required for the recipe to marinate the chicken. The chicken will not be too salty as some salt will eventually dissolve into the stewing liquid. This method works well because it has taken into consideration of the loss of salt due to stewing. Marinate for a few hours or at least 30 minutes. It is advisable to use a disposable hand glove when you marinade the chicken, as the turmeric will leave a yellow stain on your hand. Deep-fry the chicken chunks until the skin starts to turn brown, which will take a minute or two in the hot oil at 190°C/375°F. Deep-frying creates the aroma through the Maillard reaction. Remove the chicken chunks from the oil once it turns brown. It does not matter if they are still half cooked, as we will continue cooking the chicken with the curry paste and the coconut milk for another thirty minutes or so. Step 2- Preparing the ingredients for the curry paste. The plethora of herbs and spices in this Nyonya chicken recipe defines the unmistakable flavor and aroma of Kapitan Chicken. Here is the list of the ingredients for this Malaysian curry paste. You should be familiar with most of them, but some can be considered exotic to you. Onions and garlic are the base ingredients of the paste. We use red onions to make the curry but yellow onions are equally good. Remove the skin of the onions and quartered them. You can leave the garlic as the whole clove without the skin. Both are soft to be blended effortlessly. Kapitan Chicken required a small number of chili as compared to other types of curries. That is why it is so popular among the Malaysian Chinese who are not used to the fiercely hot Malay dishes. I have another typical Malaysian curry chicken recipe that required double the amount of chilies. The type of chili I used is the local red Serrano chilies. If you can’t get it, used any Serrano chilies you can find. You need to use chilies with similar hotness and flavor as the Serrano to bring out the authentic taste of Kapitan Chicken. Therefore, green chili, bird’s eye chili and capsicum (bell pepper) will never be used as the substitute. You can reduce the number of chilies. Since you want the flavor, remove all the seeds instead of reducing the number to lessen the hotness. Use an equal portion of the dry and fresh chilies. Fresh chilies will give the dish the flavor of freshness while dry chilies will add more fiery hotness to the recipe. Galangal is used in almost every version of Malaysian curry paste. Galangal is much harder than ginger and lemongrass. Therefore, the food processor may not blend the large pieces effectively into a paste. You can either finely dice it or cut it into thin slices so that it can be blended well along with the softer ingredients. The curry will taste good if it is smooth and without the remnant of the large pieces of galangal. Lemongrass is relatively easier to blend compared to galangal. Discard the green section and use only the white section. Cut the white section into short pieces. Most of the household blender can handle lemongrass with ease. You can also bash the lemongrass and stew with the chicken to extract its flavor. The bashed lemongrass should be decarded before serving. I do this in my rendang recipe, but for now, I will include the lemongrass in the curry paste. Candlenuts do not give much flavor. The primary purpose is to thicken the gravy (works pretty similar to potatoes). You may use cashew nuts as a substitute if candlenuts are not available. Candlenuts are not that hard. You can add the candlenuts into the food processor along with other ingredients. You can also crush them and add to the stew directly. Turmeric is also called ‘yellow ginger’ in Chinese. It has the intense yellow color that can stain your hand. Use a pair of the disposable glove when you cut the turmeric. It can stain your fingers as well as any plasticware. Use a ceramic or glassware whenever you want to marinate the chicken with turmeric. Fresh turmeric is always the better choice. However, since you need to use ground turmeric to marinate the chicken, you may want to use itt for the whole recipe. Use only half of the amount if you decide to use the ground turmeric. Most Nyonya food (a hybrid of Malay and Chinese cuisine) include turmeric into it, and this Nyonya curry is of no exception. Belacan is a shrimp paste commonly used in Malay cuisine. Belacan is salty with an intense umami flavor. A small amount is sufficient so that not to overpower the flavor of other spices. Who doesn’t know how to blend the spices? However, there are a few points to take note as we are working on a few ingredients with different degree of hardness and shape. Cut the galangal into small pieces before blending to avoid overexerting the food processor. Soak the dry chilies in hot water for about 15 minutes or until it is soft and cut it into short pieces. Remove the seeds from the red chilies. Cut them into short pieces. Remove the outer layer of the lemongrass, discard the green section and use the bulb only, which is white. Cut the white section of the lemongrass into short sections. Cut the onions into large pieces, and leave the whole clove of garlic as it is. Cut the turmeric into slices (use your glove ). Drop a piece of belacan and the candlenuts into the blender. Blend these items finely and until homogeneous. You may experience some small pieces of galangal and lemongrass remained in the gravy after cooking if you do not blend the paste until it is smooth enough. It is different from the Malay and Indian curry as it is not only cooked with less chili, but the common herbs in Indian curries such as cumin, fenugreek, and fennel are hardly used. Instead, belacan and turmeric are added in a small amount with the abundance of coconut milk. Step 3- Prepare the remaining ingredients for Kapitan Chicken. I can get freshly squeezed coconut milk on demand at the market. Fresh coconut milk tastes better and has a better aroma than the canned version. But if it is not available, use the canned or boxed version as the alternative. Check the content of the coconut milk. It should have at least twenty percent of fat. Add the coconut milk to the sauteed curry paste to form a thin gravy, Add the chicken and cook for 30 minutes or until the chicken chunks are cooked thoroughly. You may want to add some water if it is too dry. You can substitute half of the coconut milk with plain yogurt. Some people want to be healthier and prefer to use less coconut milk. I use coconut milk solely as this is the original way to prepare Kapitan Chicken. There is NO substitute for the aroma of kaffir lime leaves. You have to omit it if not available. If you have it, cook with the chicken to extract the flavor. You can also use kaffir lime leaves to garnish the chicken. To do this, stack up a few pieces of the leaves, roll them up tightly and cut into fine strips. Sprinkle some of them on the chicken when served. A small amount of tamarind adds a subtle sour note to the curry. You can use tamarind concentrate (or tamarind juice) as the substitute for fresh tamarind pulp. Add some warm water to the tamarind pulp and let the pulp dissolved into the water. Set aside for ten minutes and then filter the pulp and seeds away. Use only the extracted juice. Another substitute is Assam Keping (also called Assam Jawa). We can get it anywhere in Malaysia and Indonesia. However, it may be hard to get outside the South-East Asia region. Palm sugar is derived from the sap of the flower of the coconut palm. It is very close to brown sugar but with a more intense caramel flavor. It usually sells as a small cylinder block about ten-centimeter height. Shave off the required amount of palm sugar from the cylinder block with a knife and add to the stew. It helps to balance the sour flavor of tamarind. You can use brown sugar as the substitute. Step 4- Put it all together and cook. The cooking part of this recipe is simple once you have all the ingredients ready. Saute the curry paste with some vegetable oil in a wok until it turns aromatic. It may take five to ten minutes. By then, the red chili oil will separate from the paste. Add the coconut milk, kaffir lime leaves, and palm sugar to form a thin sauce. 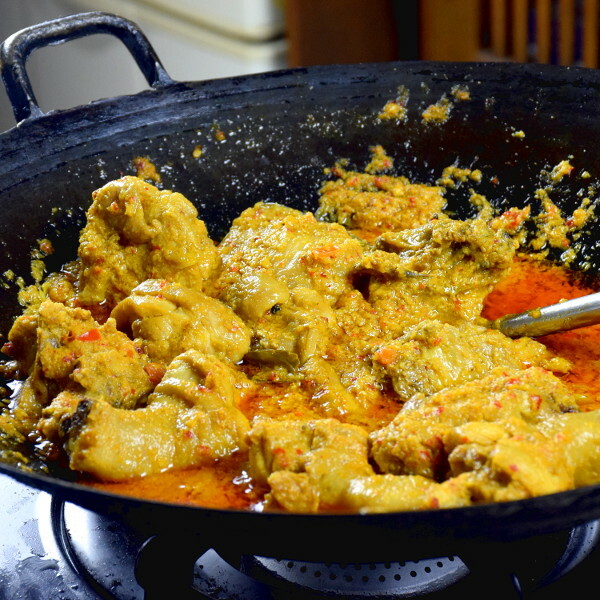 Add the chicken that has been deep-fried into the curry paste. Stew for about 20 minutes or until the chicken chunks are cooked thoroughly. Dish out and serve. Garnish with cut red chilies and thin strips of kaffir lime leaves. 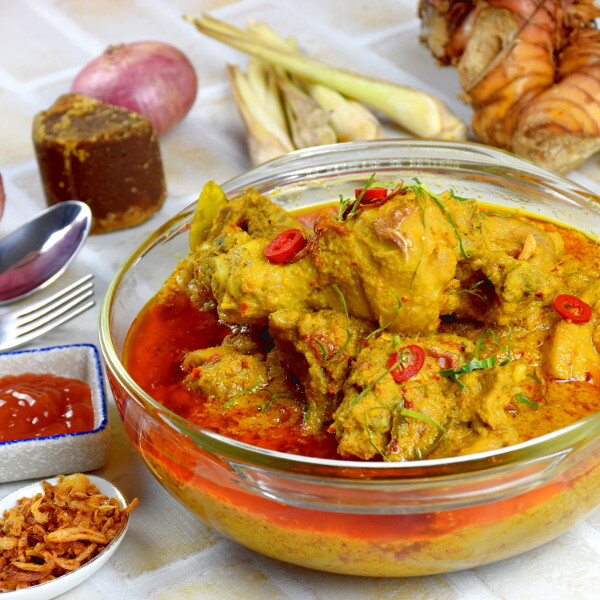 Kapitan chicken (Ayam Kapitan in Malay) is truly a Malaysian curry, the result of the amalgamation of the diverse array of Malay, Chinese and Indian eating culture. Marinate the chicken with turmeric powder, salt, and vegetable oil Stand for at least 30 minutes or longer. Deep fry the chicken pieces until the skin turns brown. Remove and set aside. Cut all the ingredients in (B) into small pieces. Blend until it forms a homogeneous paste with a food processor. Finely chop one medium size tomato. Saute the curry paste in a wok until fragrant. Add the chicken, coconut milk, kaffir lime leaves, tamarind juice, tomatoes and palm sugar into the wok. 7 replies to "Kapitan Chicken – How to cook in four simple steps"
Appreciate how detailed the recipie are . Kwan also anticipated problems a novice cook will encountet. Ham choy arp tong-salted preserved vegetables duck soup. 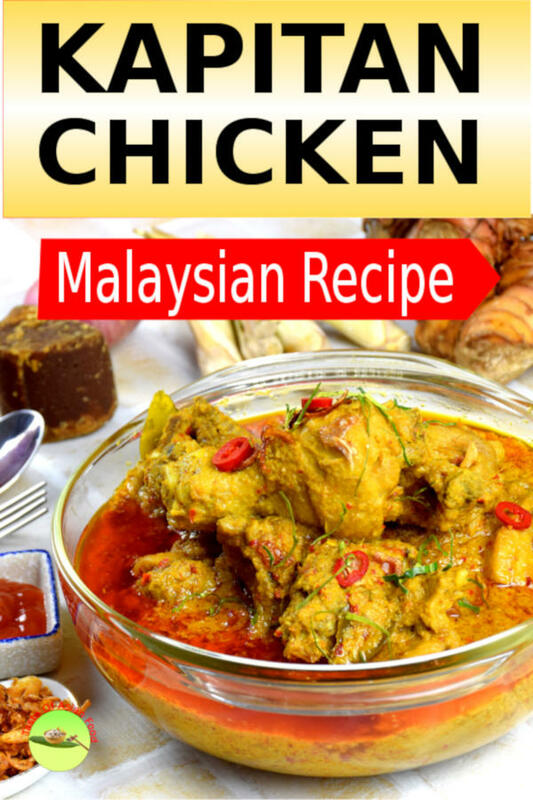 Thanks for reading my recipe and please try out the Kapitan chicken. I have not done the 鹹菜鴨湯 before, but I guess it won’t be too difficult. If I make it successfully then I will post it later. How much waterto make tamarind juice. How many ml in your 250g of coconut milk? 1. Just put the tamarind in a small bowl. Add some warm water until it covers the tamarind. Give it a few stirs until the tamarind mixes well with the water. Leave it aside for at least 5-10 minutes. Filter/strain away the pulp and seeds. Use the water only. The amount of water is small compared to the total quantity of the dish. So it does not require a very accurate measurement. 2. I use a digital scale in the kitchen, and that is why it is in gram. You can use 250ml of coconut milk to cook kapitan chicken should be fine. Is there an error with the amount of belachan? From your video the amount looks like more than 4 g.
It should be fine with 4g. I might cook a larger amount while shooting the video so please follows the quantity in the recipe. The flavor of belacan is not very strong so you can increase to 2x if you like belacan flavor.